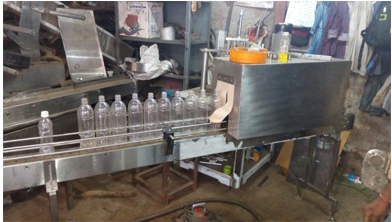 5 Head filling machine shall be designed for filling Mango Juice 200ml in PET Bottles. 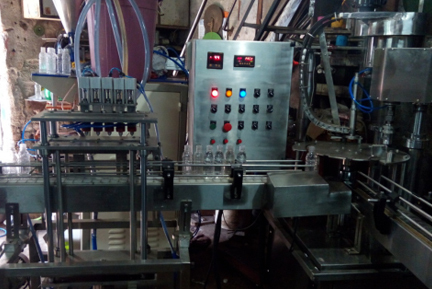 • The filling machine will be operated automatic type with 6 heads preferably with elevated type Bottle holding to facilitate filling of bottle without any spillage upto its desired neck limit. All the working parts of the machine coming in contact with the product are S.S.304 (filling cylinder & nozzle). • Filling head height will be adjustable. Veena Pharma Automatic Single Head Screw Capping Machine is versatile, self-supported on stainless steel leg with height adjustable system. The machine is precision built on sturdy welded Mild steel frame completely enclose in stainless steel and doors are provided to facilitate the servicing of machine. 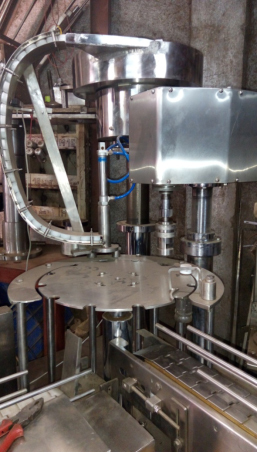 The feed PET Bottle moving on conveyor belt are fed into an in-feed star wheel, bringing the bottle below the sealing head in the subsequent indexing part, mean while the rotating bottle pickup a cap from the cap star wheel which is received from delivery chute of cap feeding bowl, where the body and the neck of the container are positioned below the rotating head, here the sealing head performs perfect operation of sealing, rotating head is designed to seal container according to pre-set-torque. Cap Feeding Bowl 300 Watt. • ☆ Depends on bottle size, cap size and type of cap. • ☆☆ We can supply as per customer requirements. • ☆☆☆ With the help of change parts. • Speed 10 per minute. • Torque adjustable Low noise level, low power consumption. • MOC of Machine: Machine will be fabricated in CRC sheet in 16 gauges for outer cover with suitable angle and powder coated body whereas inner surface of tunnel will be in SS 304 16 guage. • Power Load: Single Phase, + Neutral, 4 KW, 440 V.